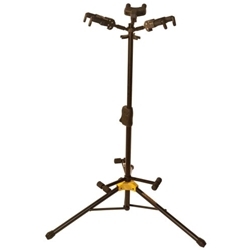 The Tri Stand Guitar Stand safely supports 3 guitars or basses. Features innovative Hercules Auto Grab System (AGS) yokes: the arms turn in and up with the weight of your guitars to hold them securely and simply open up when you lift them off. All contact points with the instruments feature Specially Formulated Foam rubber is used on all the contact points between the stand and your instrument to protect its finish. Also features the Hand Grip Height Adjuster, which makes adjustments a breeze with a locking pin to secure the stand in place. Folding backrests flip down to support your guitars and back up for storage and transport.